Baked Sesame Tofu Sticks with Peanut Butter and Tahini Sauce are a delicious treat that’s vegan, dairy-free, low-glycemic, and South Beach Diet friendly. And with the right ingredient choices this can be low-carb and gluten-free. Use the Diet-Type Index to find more recipes like this one. 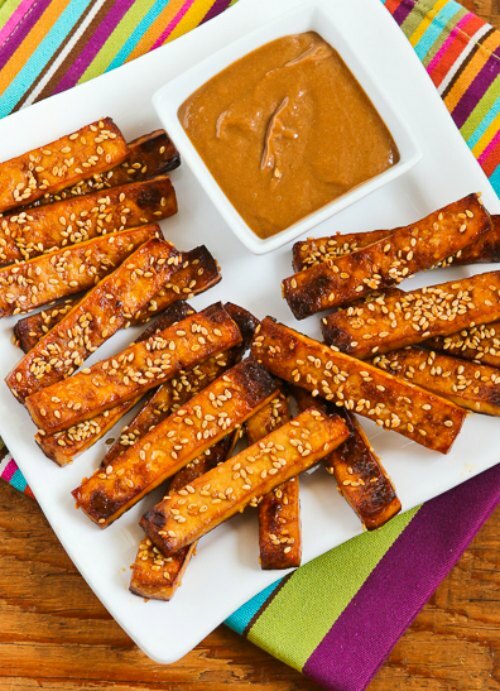 Click here to PIN Baked Sesame Tofu Sticks with Peanut Butter and Tahini Sauce! with Peanut Butter and Tahini Sauce. Even in families who are committed to Meatless Monday meals, I’m guessing tofu can be a tough sell sometimes. And the idea of convincing people who think they don’t like tofu to try it as a snack might be even harder! But don’t give up on getting your family to enjoy tofu unless you’ve tried pressed and baked tofu, because pressing out the water and baking the tofu makes it firmer and more chewy, and that should make it more appealing to people who don’t like the texture of softer tofu. And if you have a delicious peanut buttery sauce to dip those tofu sticks into, I think that makes it even better. I tried three versions of these Baked Sesame Tofu Sticks with Peanut Butter and Tahini Sauce to get one I thought was just right. The tofu sticks were delicious warm, and I even liked the leftovers that had been in the fridge for a few days! Put one 14 oz. package into a colander placed in the sink and let it drain for a few minutes. Then cut the tofu in half to make two thinner pieces. You need to press out most of the water if you want the tofu to get crisper and chewier. Lay the two pieces on a double layer of paper towels. Put another double layer of paper towels on top of the tofu pieces, and put something heavy (like a big cast iron pan) on top of the towel. Let tofu press about ten minutes (you can see how much water was pressed out.) Then replace with fresh towels and press again for about 10 minutes more. (Or longer is even better if you’re not in a hurry!) While tofu is pressing, whisk together sesame oil, soy sauce, rice vinegar, agave nectar (or sweetener of your choice), Sriracha Sauce, and ground ginger to make the marinade. Cut each piece of tofu into ten strips, about 1/2 inch wide and lay them cut side down in a large baking dish. Pour marinade over the tofu, brushing so all sides are coated, and let it sit 10-20 minutes to absorb the flavors. When tofu has marinated, sprinkle 2 tsp. toasted sesame seeds over the first side, turn pieces over, and sprinkle 2 tsp. more over the second side. Brush a small baking dish with peanut oil (or another high smoke-point oil) and lay out the tofu strips so they aren’t touching. Baked 20 minutes in preheated 400F/200C oven. to mix together the ground ginger, peanut butter, Tahini sauce, soy sauce, agave nectar (or other sweetener of your choice) rice vinegar, and water to make the sauce. After 20 minutes the tofu will be getting lightly browned like this. Turn each piece over and put back in the oven to cook the other side, 10-20 minutes depending on how firm and browned you’d like it. I cooked mine about 20 minutes more, and here’s how it looked when it came out. Serve hot or room temperature, with Peanut Butter, Tahini, and Ginger Sauce for dipping. 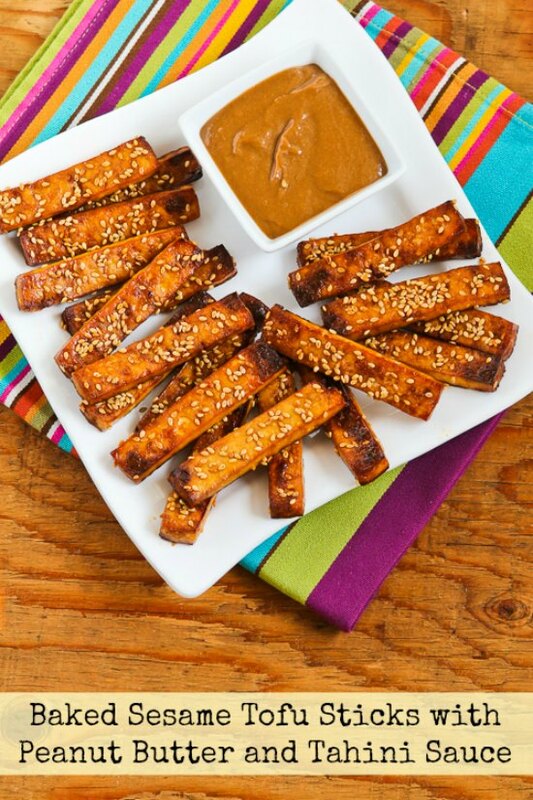 Baked Sesame Tofu Sticks with Peanut Butter and Tahini Sauce are a great snack. Take tofu out of the package and put in a colander placed in a sink. Let drain for a few minutes. Then cut tofu in half lengthwise to make two thinner pieces. Put a double layer of paper towel on a cutting board, put the two tofu pieces on the towel, and top with another double layer of paper towels. After 10 minutes remove the heavy object, discard the wet towels, and press again with new double-layer paper towels on top and bottom of the tofu. Press about 10 minutes more, or longer is even better if you’re not in a hurry! While tofu is pressing, whisk together the sesame oil, soy sauce, rice vinegar, agave nectar, Sriracha Sauce, and ground ginger to make the marinade. Cut each pressed tofu piece into about 10 strips, each about 1/2 inch wide. Lay the tofu strips larger cut side down in a flat baking dish. Pour the marinade over tofu, brushing and turning if needed to make sure all sides are covered. Let tofu marinate 10-20 minutes. Then sprinkle 2 tsp. toasted sesame seeds over the tofu pieces; turn and sprinkle the other 2 tsp. sesame seeds over the other side. Lay tofu strips on the baking sheet, taking care not to knock off the sesame seeds. Bake tofu 20 minutes on first side. Turn carefully and bake 10-20 minutes more, depending on how browned and crisp you’d like it. Serve tofu hot, with sauce for dipping. I was surprised that this was still pretty tasty after it has been in the fridge for a couple of days, although it’s better when it’s freshly made and still hot. In this recipe Kalyn combines ideas from several recipes spotted in cookbooks, but the original idea came from a sesame tofu recipe in Power Foods. Tofu is a good low-glycemic choice for any phase of the South Beach Diet, but for Phase One limit to 1/2 cup serving size. If you’re making these Baked Sesame Tofu Sticks for Phase One it’s probably best to use an approved sweetener instead of the agave, although the amount of agave consumed would be pretty small because you don’t eat the entire amount of marinade or sauce. With approved sweetener, this should also work for most low-carb diet plans. Hello! Wondering if these taste any good the next day? Hahah. I don't think I could ever sell my boyfriend on the idea, but this might be something I could eat for lunch alongside a salad? Could I make it Monday and eat for a couple days? Or is this totally an "eat while fresh" kind of thing? I talked about that at the end of the recipe; it's not bad cold but best when freshly made. I made just the marinated tofu sticks tonight (I made my own Thai sweet chili sauce and was dying to have something to dip in it). These tofu sticks were perfect. I was actually surprised how good it was. I'm not a very good cook. 🙂 I will try your sauce sometime soon though; it looks delicious. So glad you enjoyed the tofu; I think Thai Sweet Chili Sauce sounds great with this! Thank you for this great recipe! I've made it several times, as my 7-year-old son frequently requests it! How fun to hear that, thanks! Glad you liked it! And I love it when people are able to sub ingredients they have on hand and make it work! These are very good. I used balsamic vinegar and maple syrup, because that's all we had, and no tahini. Everything was delicious, and something I'll definitely make again. I used this recipe tonight for dinner and I'm really happy with it! I cooked some jasmine rice with froze stir fry vegetables and doubled the sauce and mixed it in. I cubed the tofu and mixed it all together – yum. I thought it was a bit salty, so I'll do 1.5 times the soy sauce instead of double the soy sauce next time. Yes you can definitely marinate the tofu longer. I'd keep it in the fridge, covered with something. This looks so great! Can any of this be made in advance? For example, can I marinate the tofu for longer (1-2 hours instead of 10-20 minutes)? I want to make this for snacks after an outing, and would love to just stick it in the oven when we get back home. Laura, so glad you like it! Kimberly, so great to hear you enjoyed it so much! Lauren, so glad you liked it! Just made this for dinner and it was absolutely delicious. I used half the amount of tofu, so halfed the marinade and it came out perfect. I also stir fried a load of veggies and added the sauce to that, can't wait to make this again! Catherine, so glad you enjoyed it! Thanks Kalyn, this was amazing! I always thought of tofu as an “alternative” ingredient in food, something to be tolerated if it showed up in identifiable form in a recipe. This changed my mind to the point where I intend to put it into the regular snack rotation. YUM! Thanks Cheri! I don't make it to Whole Foods too often, but I will have to check it out. Whole Foods has a tofu dish kind of like this that I love. This looks very similar. Great presentation! Amy, hope you like it. TW, I agree about the texture. No problem for me. But I keep hearing people don't like it. This might help if that's the case. I run in cycles with food, and I can feel a cycle for this sort of thing coming on! Great idea for spring. Perfect recipe for me, can't wait to try it. With those delicious ingredients in the marinade, I could see throwing this tofu into a salad, too. I never used to like tofu, but it has grown on me and even the tofu-adverse might like this. I've never had an issue with the texture of tofu – this looks like a lot of fun to make, and a really interesting option for appetizers that would win over anyone! Thanks for this recipe! I have been looking for something like this to serve to my daughter who is a vegetarian. And the sauce looks delicious for uses in many dishes. Thanks Dara, glad you like it. And I could eat this sauce on almost anything! Years ago I took a Chinese cooking class and we made a tofu dish very similar to this. Beforehand, the thought of tofu made me cringe. But there's something about baking it and pairing it with a great sauce that makes it irresistible. Joanne, the sauce is really good and the texture is definite not like tofu! I was thinking you could dice up any leftovers and add them to an Asian slaw or salad, and it would be delicious! I'm a big tofu fan but the.boy isn't crazy about it. I think I could win him over with the peanut butter sauce though!